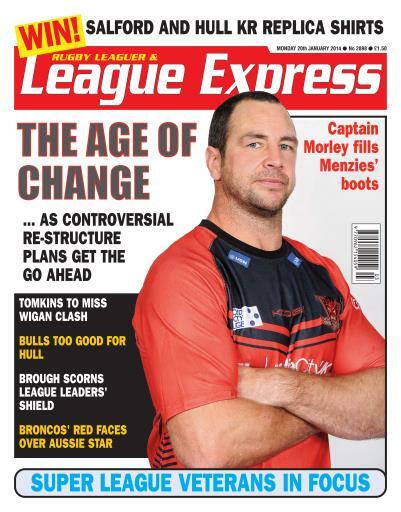 Inside this week's League Express we explain what went on at the recent Super League club meetings, and we explain where Rugby League goes from here. We speak to RFL Chairman Brian Barwick about the events of the last week. We have a major feature on the older players who will be gracing Super League in 2014, and we speak to Danny Brough about why he doesn't want to win the League Leaders' Shield in 2014. We preview the 2014 seasons for Salford Red Devils and Hull Kingston Rovers, speaking to coaches Brian Noble and Craig Sandercock about their prospects. And we give our readers the chance to win replica shirts from both clubs. We also look ahead to the new season in a crucial year in the Championship for Sheffield Eagles and Swinton Lions. We interview Castleford star Michael Shenton 'Off the Field'. Editor Martyn Sadler reviews the decisions taken by the Super League clubs, and analyses what should be done now by the RFL. 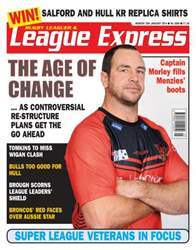 Garry Schofield looks at those clubs that he believes will finish in the bottom half of Super League in 2014, while Malcolm Andrews can't wait for the NRL pre-season games to begin.